The top photo shows New Zealand police officer Brendon Ronald donating textbooks to pupils of Audian primary school in Timor-Leste (East Timor). After years of civil war and rioting in the former Indonesian province, New Zealand police joined a United Nations-led international assistance force in that country. Their role included crime prevention, restoring order and training local police in the region east of the capital, Dili. 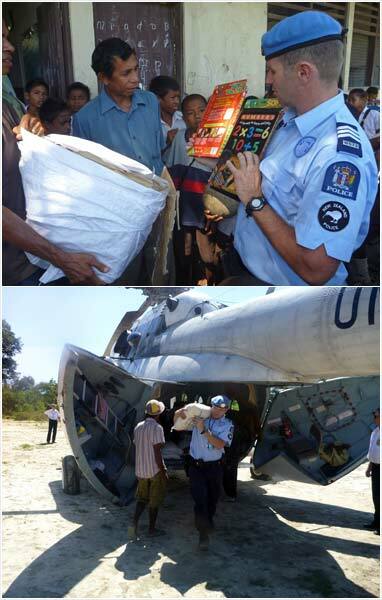 The bottom photo shows New Zealand police working with a United Nations team on flood relief in Timor’s Zumalai region.